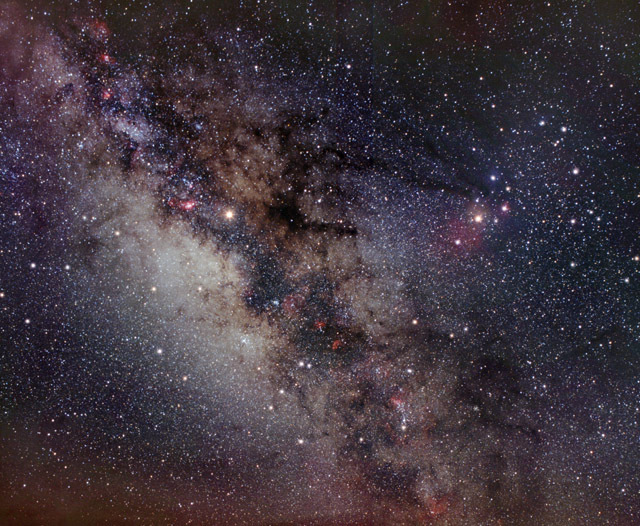 The center of our galaxy is located in the direction of the constellations Sagittarius and Scorpius. The stars are so numerous there that they appears as vast clouds, interspersed by dark dust lanes. The bright amber "star" in the center is the planet Mars, with diffraction spikes from the lens diaphragm. Some of the nebulae and clusters here can be seen close-up by clicking on them in this image.